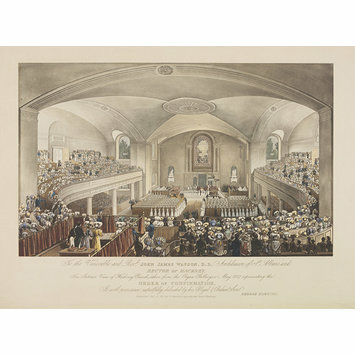 Coloured aquatint depicting an interior view of Hackney Church, taken from the organ gallery, during the order of confirmation. Is with permission respectfully dedicated by his Obliged & Obedient servt. Published Decr. 31. 1827. by G. Hawkins opposite the Grove, Hackney. This object was part of the John Edmund Gardner collection of topographical prints and drawings of London. After Gardner's death the collection passed to his son Edmund Thomas, but was sold to Edward Coates MP in 1910. The collection was sold again in 1923 after Coates' death, and was split between various institutions and private collectors. The portion connected with Hoxton, Homerton, Hackney and Bethnal Green was bought by the Hon. Arthur Villiers and donated to the Bethnal Green Museum. 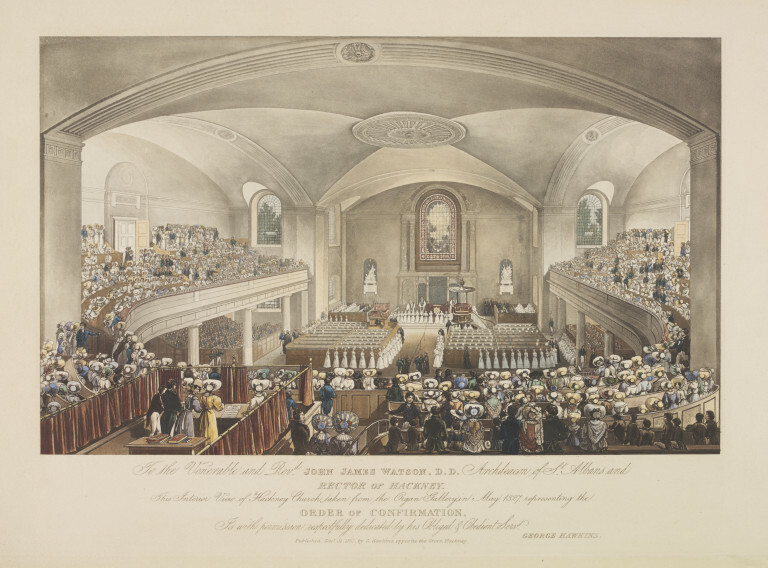 Coloured aquatint, interior view of Hackney Church, G. Hawkins, May 1827.